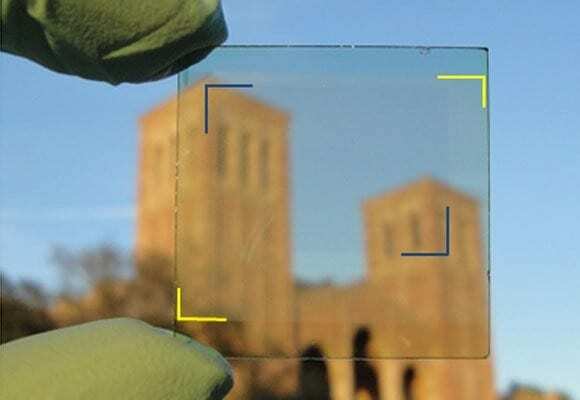 One of the holy grails of solar cell technology may have been found, with researchers at UCLA announcing they have created a new organic polymer that produces electricity, is nearly transparent and is more durable and malleable than silicon. The applications are mind-boggling. Windows that produce electricity. Buildings wrapped in transparent solar cells. Laptops and phones – or even cars or planes – whose outer coverings act as chargers. It might even be sprayed on as a liquid. The promise of cheap and easy-to-apply site-generated solar electricity might now be a lot closer to reality. Of course, the idea of solar films and solar plastics is not new. The breakthrough to making a transparent film, however, came with isolating only one band of light in the spectrum. “And then we also invented a new electrode, a metal, that is also transparent. So we created a new solar cell,” Yang adds. Well, the metal is actually not transparent, Yang points out; it’s just so small that you can’t see it. The new polymer incorporates silver nanowires about 0.1 microns thick, about one-thousandth the width of a human hair, and titanium dioxide nonoparticles as an electrode. When in liquid form, it is as clear as a glass of water, and when applied to a hard, flat surface as a film it is meant to be invisible to the eye.